This lighthouse is sited, somewhat unusually, on Hull Road in the town centre of Withernsea. It is also architecturally unusual, for England at least, in the fact that it is a brick built, and tapered, octagonal tower. Although it is positioned in the centre of town this was not the result of any particular planning decision, or an attempt to keep the lighthouse safe from coastal erosion. It was simply placed there because, at the time it was built, the land between the lighthouse and the coast consisted simply of sand dunes and a lagoon. Rather than the lighthouse being placed in the centre of the town, the town has grown up around the lighthouse. As well as its unusual external appearance, the interior is also somewhat odd - because the tower was never designed to house keepers, there are no internal floors between the base and the lantern, the tower being empty apart from a spiral staircase. The light was deactivated in 1976 and its fresnel lens was transferred to St Mary's Lighthouse. The former keepers' cottages at the base of the tower now house a cafe and a museum of local and maritime history. 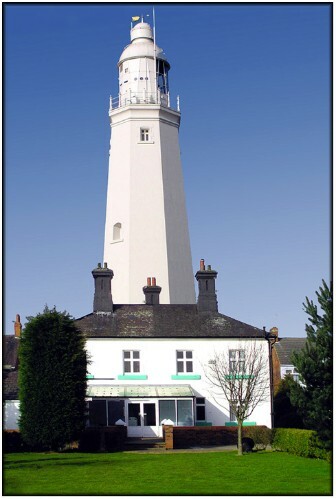 The lighthouse is open to the public between Easter and October and is now managed by the Withernsea Lighthouse Museum - more details about access, admission charges and so on can be found on their website here. I have only made one visit to this site (in 2003) and I found photography of the lighthouse to be particularly tricky. The view from the street is severely impeded by foreground clutter, overhead wires and street furniture. The view from the gardens at the rear of the lighthouse (from where the image above was taken) is better but requires a wide angle lens. 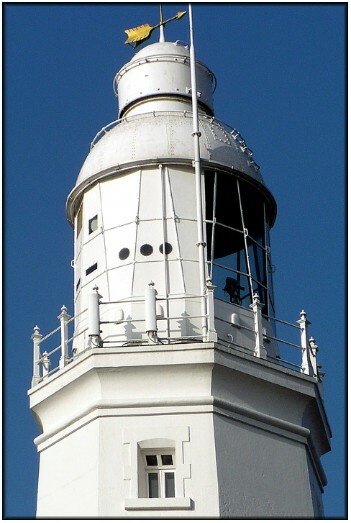 The photograph below shows a close-up of the lantern.